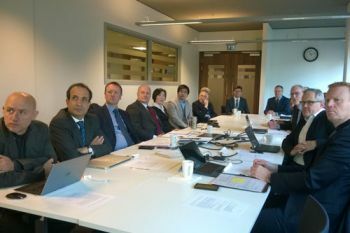 Senior academics and university officials discuss a range of mutually beneficial topics with executives from the leading engineering firm. The Howden Research Day took place on 29th February 2016. It was a high-level meeting organized by the Centre for Compressor Technology, drawing together several senior academics and officials from across the School of Mathematics, Computer Science and Engineering and The Cass Business School, who met with executives of leading engineering giant Howden, a company specializing in air and gas handling products and services to the power, oil & gas, mining and petrochemical industries. Howden has enjoyed a mutually beneficial relationship with City over the last decade in knowledge and technology transfer, especially in the use of rotor and screw compressor developments within the Research Centre for Compressor Technology, spearheaded by the Howden Chair in Engineering Design and Compressor Technology, Professor Ahmed Kovacevic. The Howden Research Day encompassed a range of areas, including placements of City students at the company and the industrial application of City’s research outputs in the fields of turbo claw, centrifugal compressors and fans, sensing and big data, and cyber security applications. “I have already heard about this great collaboration between Howden and City and I thought this was a fantastic event. In the era in which we live, a lot of effort is drawn towards more systematic and strategic fostering of collaboration between industry and universities like ours. I am confident City will continue to reap success with our approach”. “We have a long history of successful partnership with City University on screw compressors which has had made a massive impact on our business. With the research meeting we have explored ways to extend this to other areas of involvement and tighten our collaboration”. Engineering design is the process of devising a system, component, or process to meet desired needs. It is a decision-making process (often iterative), in which the basic science and mathematics and engineering sciences are applied to convert resources optimally to meet a stated objective.